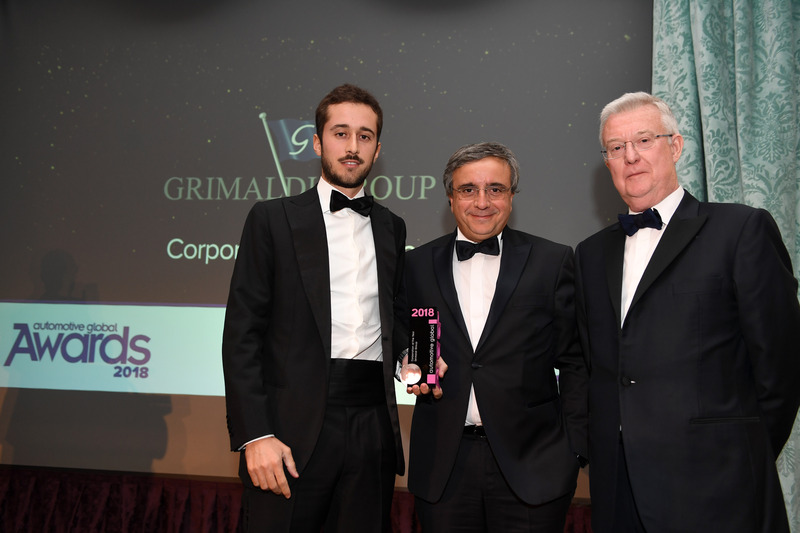 Naples, 8th November 2018 – In the exclusive setting of The Savoy Hotel, in Central London, the Grimaldi Group received the Corporation of the Year Award and the Shipping Company Award last 1st November, during the 2018 Automotive Global Awards. The event was organized by Three6Zero, an editorial group specialised in the automotive industry with various publications distributed in America, Asia, India and Europe. The Automotive Global Awards are centred on a desire to acknowledge, celebrate and commend innovation and service excellence across the automotive industry. The Awards are assigned annually by a jury of experts, which identifies the global excellences involved in the automotive supply chain. The Grimaldi Group was awarded both as corporation of the year and as one of the best shipping companies in the light of its outstanding work and performance in the global supply chain. Notably, the company continued to expand its maritime services as part of a plan to provide worldwide logistics with a strong maritime base to the biggest vehicle manufacturers. Moreover, while building its own international network of port terminals, several strategic acquisitions and shareholdings in major shipping companies have strengthened the Grimaldi Group’s leading position in the ro/ro business. The company has thus established an extensive network of “Motorways of the Sea”, calling at more than 120 ports in the Mediterranean and Baltic regions, Northern Europe, West Africa, North and South America. The judges also praised the Grimaldi fleet – one of the youngest, most modern and environment-friendly in the world –, the Group’s cutting-edge technologies and its substantial investment in training and education. The awards were collected by Costantino Baldissara, Commercial, Logistics & Operations Director of the Grimaldi Group, who commented: “It is a great honour for us to be here. These awards prove once again that the efforts and investments of our Group go in the right direction. Therefore, we renew our commitment to provide even wider and more efficient transport services to all companies operating in the import/export trades worldwide”. With over 70 years of experience, the Grimaldi Group is a multinational logistics group specialized in the operation of ro-ro vessels, car carriers and ferries. The Naples-based shipping company is a dedicated supplier of integrated logistics services based on maritime transport to the world’s major vehicle manufacturers.